I was a tiny bit disappointed by this recipe. Not because it wasn't good, but because I had heard rave reviews about it. It was supposed to be fantastic, amazing, blow-your-socks-off good. Don't get me wrong, it was tasty, but not as amazing as I expected. Still, it was fast & easy, so I'm sure I'll make it again. 2. In a small sauce pot, cook onion & garlic in olive oil over low until tender & sweet. 3. Stir in brown sugar & butter. Season with salt & pepper to taste. 4. 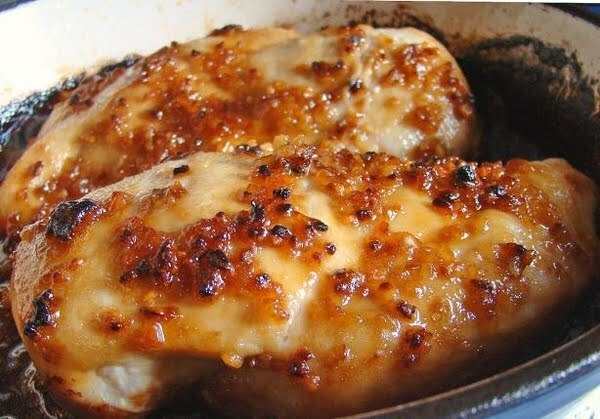 Pour mixture over chicken and bake for 20-30 minutes (depending on the thickness of the chicken).